Incoming Chelsea signing Christian Pulisic has suggested that an attacking role on the left wing suits him perfectly for the national team, a role he could also take for his new club. As noted by BBC Sport, the USA international has already been signed for £58m, but will join the Premier League giants from Borussia Dortmund this summer. Naturally, that will be met with great excitement in his hometown of Hershey, Pennsylvania, with Online gambling in PA undoubtedly set to enjoy a spike with the launch expected this year. The 20-year-old has impressed for the Bundesliga outfit to this point, scoring 17 goals in 121 appearances since moving to Germany in 2015, while he’s also bagged nine goals in 23 caps for the USA. However, moving to Chelsea and the Premier League will be a major step in his career, and amid ongoing speculation over the future of Eden Hazard, he could be set to play a fundamental role for Maurizio Sarri’s side sooner than expected. As noted by the Daily Mail, the Belgian ace is on Zinedine Zidane’s transfer shortlist at Real Madrid, and so if he were to leave, it would leave a major void that will need filling at Stamford Bridge. Pulisic has seemingly indirectly suggested that he’s up for that challenge, as he has insisted that he’s relishing the prospect of playing on the left wing for the US. “I think it’s a really good position for me,” he is quoted as saying by The Express. “Obviously I don’t mind where I play on the field, I just like to be in a good attacking areas where I can create and help the team score goals because that’s where I feel I’m at my best. I like the style that [Berhalter] has and I like that position a lot. 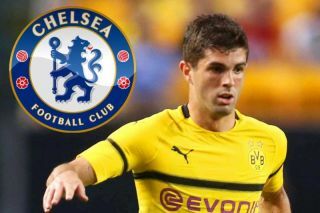 Should Hazard move on, Pulisic may well need to get used to playing in that position as Sarri will hope that he can deliver both in the immediate future and long term if he is forced to cope with the loss of Chelsea’s talisman and biggest talent. For now though, the USA international sounds focused on what’s in front of him as he prepares to represent his country during the break.